Language is a fundamental communication tool. Humans use language to convey information and meaning and as a species, humans are fundamentally good at attributing language to the context of our world. We do this through semantic cues—which could be words, signs, or images that provide a closer connection to the thing they represent in the real world. When people see text, they usually understand its meaning. When computers see text, they only see character strings, without the context of the real world or how that text relates to a person’s intent. As humans become more dependent on computing systems, it becomes more and more important for computers to understand text and language. This is where natural language processing (NLP) comes in. Machine learning and artificial intelligence are growing fields and natural language processing is facilitating the bridge between computer and human communication. Natural language processing is a field of computer science and computational linguistics concerned with the interactions between human (natural) language and the computer. Semantics refers to the relationships and meaning between words. Natural language processing is focused on helping computers leverage semantic structures of information—context within the data—to understand meaning. For example, statistical graphics can be rather abstract. 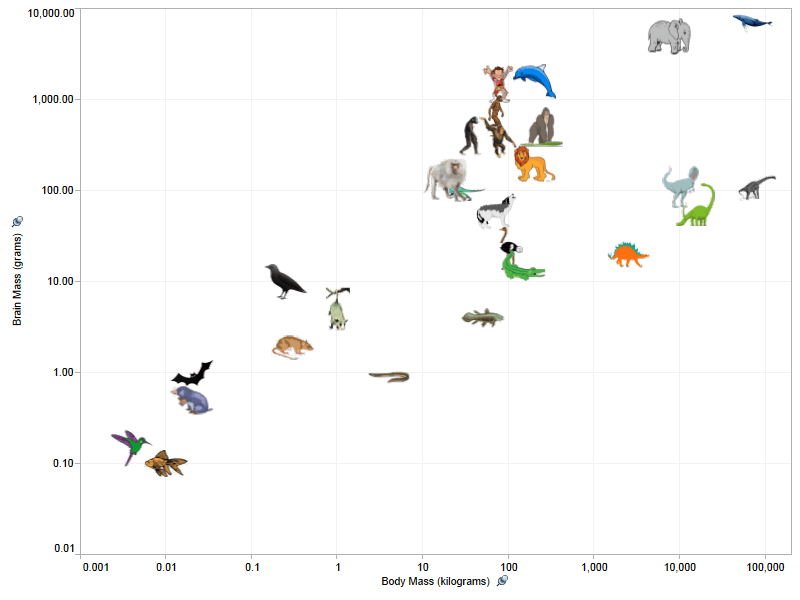 Here is a graph in log scale showing the relationship between brain and body mass for various animals. 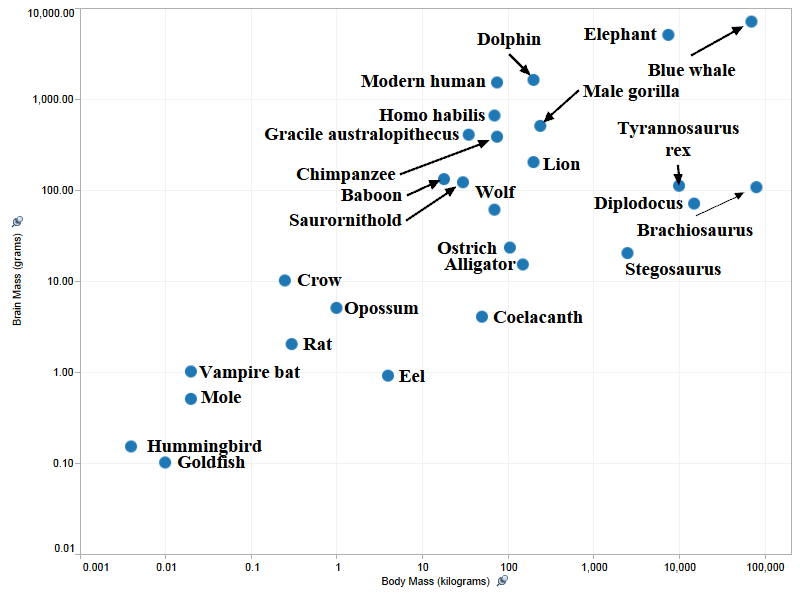 This second graph uses icons that are semantically connected to each of the animals. As a result, the graph immediately becomes more meaningful because our visual system doesn’t have to discern the patterns or clutter of the text labels in the previous image. In the same way, computers use semantics to assign meaning and intent to words and text. This allows for a conversation between a computer and an end user. Natural language has already permeated daily life. The most common examples of natural language are technologies like Alexa, Siri, and Google Assistant that recognize patterns in speech to infer meaning and serve up an appropriate response. NLP is also the engine powering some of Google’s Gmail capabilities. Gmail uses NLP to automatically parse and understand the contents of your email messages and detect things like meeting invitations, package shipment notifications, and reminders. Another common example of NLP in action is web search engines. When you type a phrase into a search engine, it will serve up suggestions based on other similar search behaviors. You can also see this in the search functionality on social media sites. Searching “people I know who live in Austin” will show a list of friends in that particular region. NLP employs robust parsing, grammar rules, and algorithms to derive intent from people’s utterances. An utterance is a statement or question fragment used in common language, made up of a series of keywords. Ruhaab Markas, Senior Product Manager on the Natural Language team at Tableau explained how “With advances in the field of natural language, machines can better handle pragmatics, deciphering context to better understand the meaning behind a statement.” As a result, NLP has become more ubiquitous for both consumers and businesses. Read the trends report to learn about advancements in natural language processing. Today, business intelligence (BI) vendors are offering a natural language interface to visualizations so that users can interact with their data naturally, asking questions as they think of them. In the context of the BI market, natural language is often categorized under the term “smart analytics”—relating to the application of machine learning and artificial intelligence. People don’t typically start from a blank state when asking questions about data. We often rely on context to spark our curiosity. Similarly in BI tools, the NLP system leverages context within the conversation to understand the user’s intent behind a query and further the dialogue, creating a more natural conversational experience. For example, when a person has a follow-up question of their data, they don’t have to rephrase the question to dig deeper or clarify an ambiguity. You could request for a BI tool to "Find large earthquakes near California" and then ask a follow-up question like, "How about near Texas?" without mentioning earthquakes for a second time. Example of someone asking questions of their data in Tableau's natural language capability, Ask Data. Natural language capabilities in BI tools allow people to get insights by simply conversing with their data. As natural language matures across the BI industry, it will break down barriers to analytics adoption across organizations and transform how people interact with data. Learn more about Ask Data, Tableau’s natural language capability.